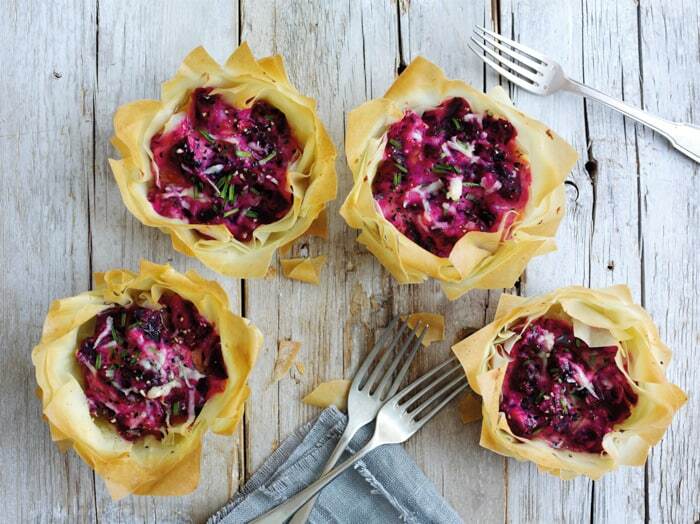 Let’s hear a YUM for these divine looking Sweet Chilli Beetroot and Ricotta Filo Tarts! They’ll make perfect picnic or lunch box fodder this summer. I love me some beetroot! In fact I have overwintered some small bulbs in the poly tunnel which have just started to wake up & get growing again. I love the raw, freshly pulled roots scrubbed, peeled and grated in salads or slow roasted in their skins under foil in the AGA. Although dealing with fresh beetroot is seriously messy and you may wish to wear rubber gloves as it stains your hands and nails for a couple of days. An easier option is to buy them ready cooked. No fess, no fuss, just instant earthy sweetness and beautifully vibrant colours. You get all of the anti oxidants with zero of the effort. These tarts are made with the sweet chilli infused beetroot available in Sainsburys. If you have any leftovers, try thickly slicing them in a cheese sandwich, or dicing into a cous cous salad. Deelish! 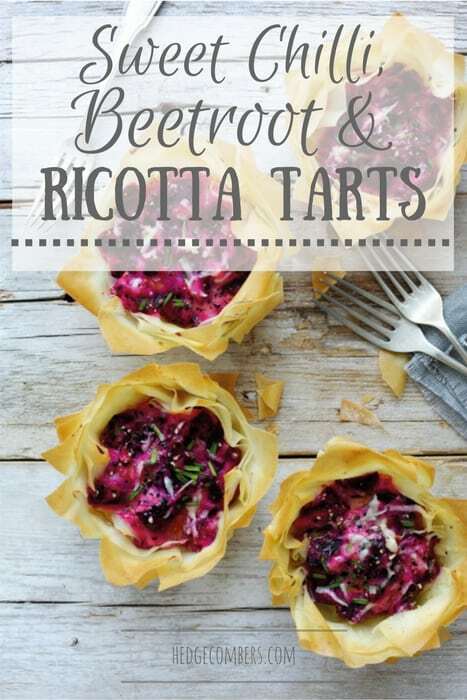 I reckon these sweet chilli beetroot and ricotta filo tarts will make the perfect centre piece for a spring picnic. I hope you give them a try! Head on over to the Love Beetroot website for more tempting ideas and recipes to make the most of this superfood vegetable this year. To make the tart mix, in a bowl add the beetroot, ricotta, egg, chives, nigella seeds and half the Parmesan and mix together. Season with salt and pepper. Butter 4 ramequins and set aside for later. Flatten the filo sheets and brush each one with melted butter. Fold over itself so it’s half the size, then brush with butter again. Rustically put each one into a ramequin, pushing down so it’s touching the bottom. Divide the mix between each case. Sprinkle the rest of the Parmesan over each one and put in the oven for 10-12 minutes. When ready, drizzle with olive oil and either serve in the pots or lift out so it’s released from the pot. Images and recipe courtesy of Love Beetroot. Huge thanks to Love Beetroot for sponsoring this post and allowing me to continue bringing you tasty recipes, for free! As always all thoughts (and leftovers!) are my own.